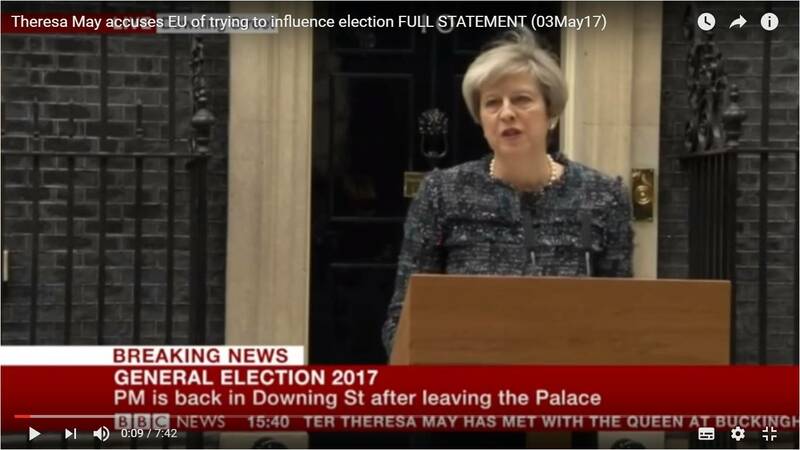 On 3 May 2017, British Prime Minister Theresa May made a statement outside Number 10 Downing Street to mark the start of the general election, for which Britons will go to the polls on 8 June. The British Prime Minister and Queen no longer play any role in promulgating dissolution into force; only the Fixed-Term Parliaments Act itself now does so. In effect, May wants to lead a Grand Coalition of all pro-Brexit voters — except that this coalition consists of only the Conservative Party. This is, of course, quite extraordinary and very unparliamentary. But Brexit has irrevocably altered the political landscape of the United Kingdom, and the standard left-right politics will not reassert themselves until at least the next general election (now scheduled for 2022 under the Fixed-Term Parliaments Act) once the two-year process under Article 50 has run its course and the United Kingdom has finally seceded from the European Union, with whatever new arrangements that London can secure from Brussels. Last year’s referendum exposed the deep divisions between Labour and Conservative supporters versus the Labour and Conservative parties themselves. Something else struck me about May’s speech. Namely, much of Prime Minister May’s campaign rhetoric and stump speech in 2017 bears a striking resemblance to those of Prime Minister Harper in 2011. In the general federal election that spring, Harper described the campaign in stark terms as a choice between a “strong, stable, national majority Conservative government” or “Mr. Ignatieff and his coalition partners in the NDP and Bloc quebecois.” Harper also noted that the Conservatives’ “priority will remain the security and stability for Canadians.” (Someone noted the similarity in wording between Harper’s statement in the foyer of the House of Commons to Emperor Palpatine’s speech to the Senate in Revenge of the Sith). Harper’s exhortation made sense coming off the heels of a minority parliament, but May’s similar plea for “strong and stable leadership” almost seems self-defeating, since the Conservatives already held a majority in the last parliament. And May’s anti-coalition rhetoric sounds especially hypocritical given that she served as Home Secretary in the Cameron-Clegg coalition of Conservatives and Liberal-Democrats from 2010 to 2015! The British press has portrayed this general election as a foregone conclusion. Even Tony Blair has stated that he expects the Conservatives to win a massive parliamentary majority against the resurgent Old Labour under its dour, ascetic Roundhead leader, Jeremy Corbyn, who demonstrates all the faults of a life-long socialist activist. Blair even pulled an Ujjal Dosanjh, who famously acknowledged his own imminent defeat in British Columbia’s provincial general election of 2001 and pleaded with British Columbians not to shut out the New Democrats completely from the legislative assembly. Blair did the same and pleaded with British voters to elect a strong Labour opposition! I’m sure that many of you will also watch this election with great interest nevertheless. May’s presidential style therefore manifests itself in this appeal where she presents herself as somehow being above normal partisan political divides, at least temporarily. It almost resembles something more like a French 5th Republic president, who holds himself above political parties, than even an American president. But as Blair implied in his comment about the necessity of a strong opposition in parliamentary systems, May’s attitude cannot last long, and it is even subversive to parliamentary responsible government over the long term. United Kingdom, The Gazette: London Gazette, “Proclamations: By the Queen Appointing Thursday the 8th Day of June 2017 as the Polling Day for the General Election of the Next Parliament,” (London: Crown Copyright, 25 April 2017), issue no. 61912, page number 8774. CBC News, “Government’s Defeat Sets Up An Election Call,” 25 March 2011.